Denton has a lot of festivals. And while Oaktopia is about to cause all sorts of ruckus in a few weeks, we really enjoy the smaller ones. KDB's Redbud Festival and Denton Main Street's Arts and Autos events are two of our favorite Saturday mornings in Denton year in and year out. This Saturday just so happens to be one of those Saturdays. 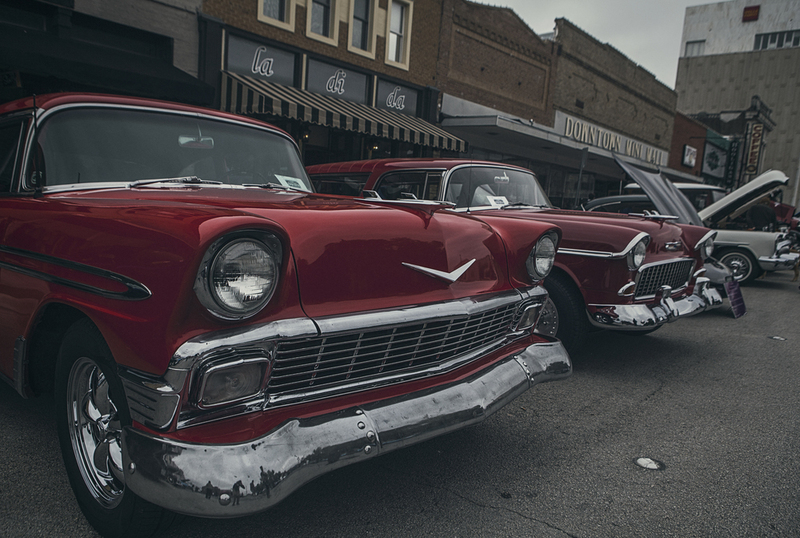 Arts and Autos (no more antiques - more on that later) is taking over the Denton square this Saturday morning from 9am until 3pm. Yes, the downtown Denton square will be cleared of cars to make room for...tons of cars! Check out some of our favorite aspects of the event in the post below so you can make the most of your time there! Make the most of the fact that the square is shut down to cars for this event. It only happens a couple of times a year. Prance down Elm. Skip up Locust St. You can jaywalk all you want (even though you probably do that already) with no danger of getting a ticket or getting hit by a car. Kinda makes us wonder how nice the square would be if it was shut down to four wheeled vehicles more often. While Arts and Autos may lean heavily to the auto side, there is plenty of art to be had, as well. One of our favorites is the chalk art contest on Oak St. Stand there for long enough and you will see beautiful squares full of color and all sorts of different art styles take over the small squares of gray sidewalk. 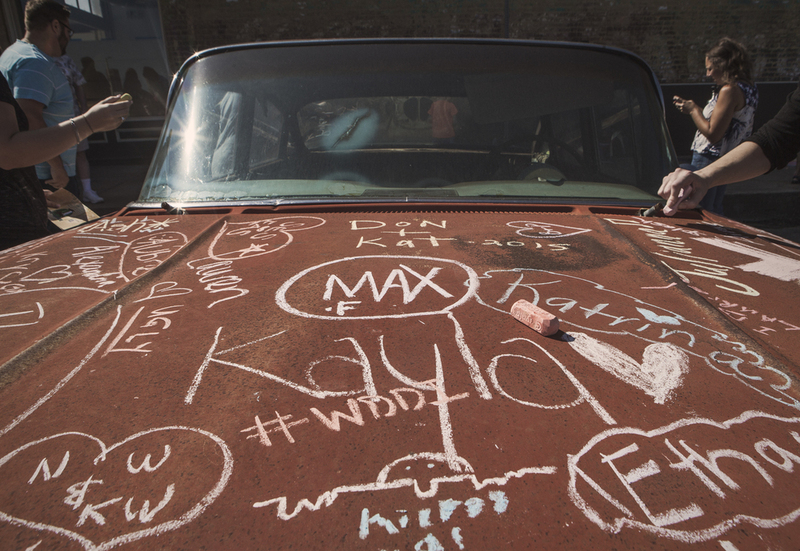 Down the street, there's usually an old car strewn about with chalk just begging for an inscription or drawing from you. Don't waste the opportunity to write, "Julie was here," even if your name is Frank. The event also features live music. The tunes begin at 10am on the square with Gumbo Brothers, followed by The Silvertones, and then ending with The Lowdown playing Soul/Rock/Funk favorites at 1pm. Go hop in one of the amazing rat rods and pretend that you are Max Rockatansky, the titular figure represented by both Mel Gibson and Tom Hardy in the Mad Max series. Rat rods are the unfinished looking hot rods that are frequently adorned or decorated with all sorts of strange items. Last year, we saw some with skulls and another with a bunch of rope holding pieces of the automobile together. These cars are a piece of art in and of themselves. Go hop in and do your best Immortan Joe impression. Wonder aloud, "Where did all the antiques go?" This event was known as Art, Antiques and Autos for several years until dropping the "antiques" last year. What antiques were actually present during the event in previous years? We don't even know, but this year sure as hell won't have 'em. Go inside the Courthouse. We rarely take the opportunity to go inside the beautiful Denton County Courthouse, but Arts and Autos is a great time to do it. There is normally something going on inside that is Arts and Autos related (normally a silent auction), but you can also take the time to check out the Courthouse on the Square Museum while you're at it. Talk to the owners who have entered cars into the show. You will definitely learn something and even if you don't, you're pretty darned likely to hear a good story. One time an old man even handed me a beer after discussing the intricacies of his car's rehabilitation. Mind you it was 10am and I don't really drink beer, but it was a nice gesture nevertheless. And finally, one of our favorite things to do during Arts and Autos is to make fun of the people that accidentally left their Jetta parked on the square overnight. In spite of the notifications cars receive downtown, there are always a couple of folks that end up accidentally leaving their cars parked on the square even though they aren't part of the show. Speaking of, if you park on the square Friday evening make sure you are able to move your car before the morning unless you just really wanna show off your Dodge Stratus.